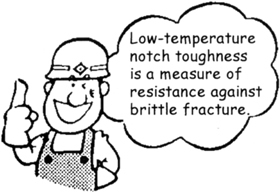 "Fracture toughness" is a generic term for measures of resistance to extension of a crack. The common methods of measuring the fracture toughness of welded joints are the Charpy V-notch impact test, the Crack Tip Opening Displacement (CTOD) test. Drop Weight test, and Compact Tension test. Of these testing methods, the Charpy V-notch impact test is most commonly used to determine fracture toughness (also known as "low-temperature notch toughness") of welds. The Charpy V-notch impact test uses the standard specimen shown in Fig. 1. When the thickness of the weld is not large enough for removing this size of specimen, a thinner specimen (sub-size specimen) may be used. The specimen is positioned with the ends of the notched surface straddling two supports and is struck opposite the notch by a wedge-shaped hammer at the end of a pendulum. 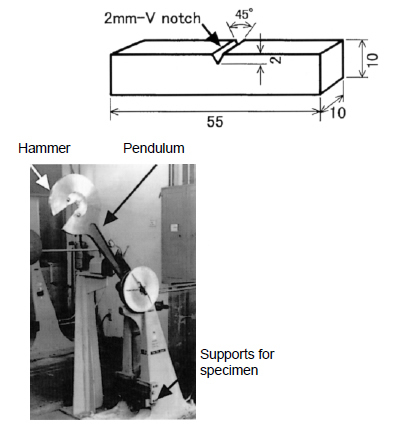 The energy absorbed in breaking the specimen is calculated from the mass and length of the pendulum, the initial height of the hammer and the height of the hammer after the fracture. For carbon and low alloy metals that exhibit a change in failure mode (from shear fracture to brittle fracture) with decreasing temperature, the test is performed at several temperatures. The most commonly reported result is the absorbed energy, but the percent shear fracture and the lateral expansion may also be reported. 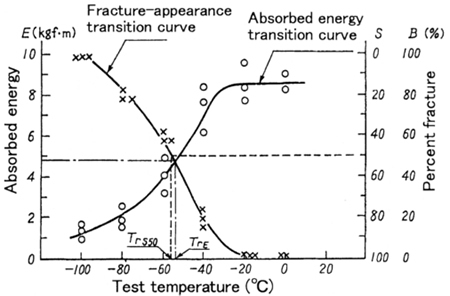 Typical transition temperature curves of carbon or low alloy weld metal are shown in Fig. 2.